Court interpreters are invaluable in today’s courtrooms. They eliminate communication barriers created by disability or limited English proficiency. They help ensure every person receives due process and has equal access to the courts in Florida. It is important for interpreting professionals to stay up-to-date with current issues and trends and changes within the profession. 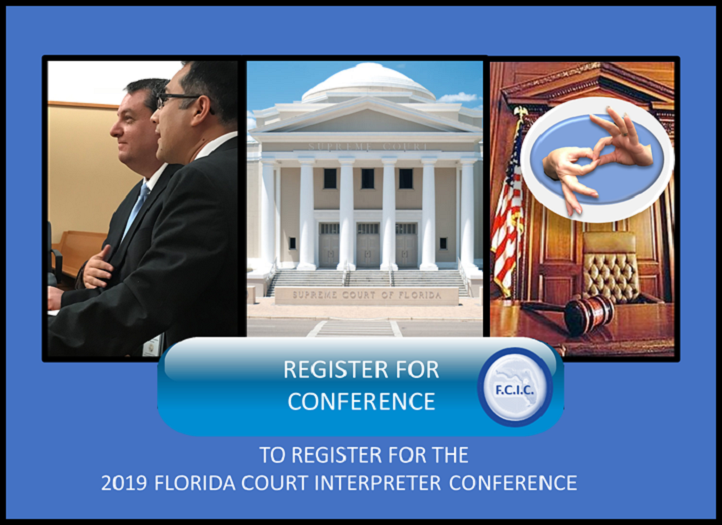 The 2019 Florida Court Interpreter Conference will bring together interpreting professionals and experts from across the state and across the country. 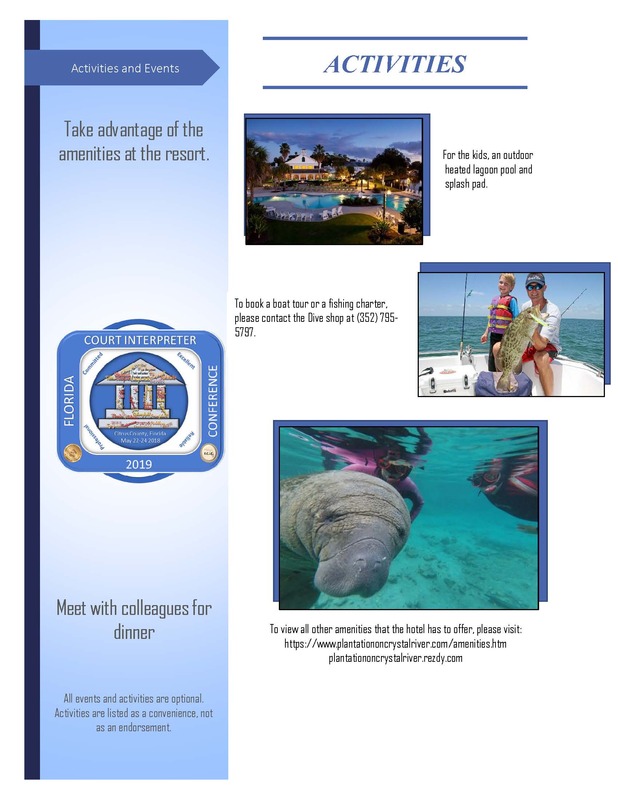 This inaugural conference offers something for everyone. 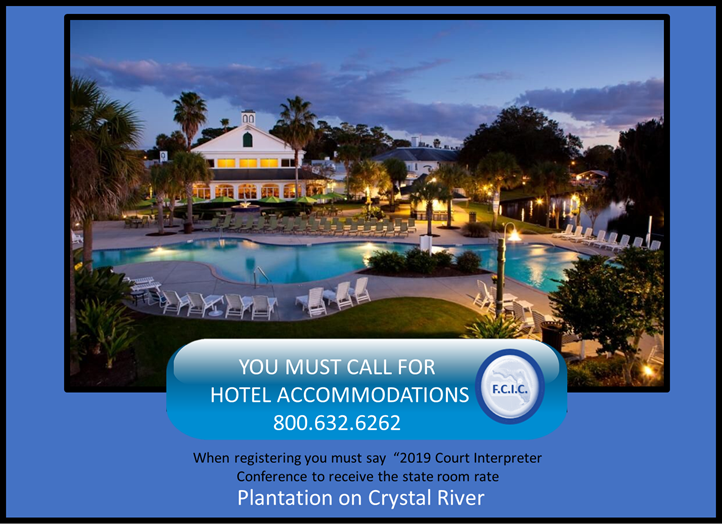 Conference attendees will learn about current issues facing court interpreters, improve skills, and enjoy opportunities to engage in thoughtful discussion about the court interpreting profession. 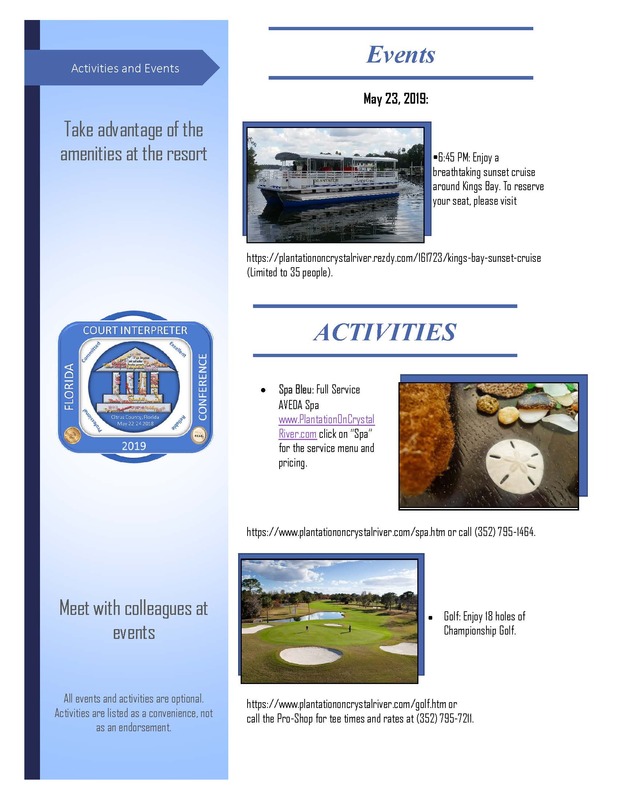 Don’t miss this opportunity to connect with others within the interpreting profession. Join other interpreters, those who are interested in being a court interpreter, university professors, researchers, students, educators, interpreting organizations, attorneys, governmental criminal/civil justice stakeholders, and court staff who support the court interpreting services profession and be a professional committed to excellence. This opportunity is a valuable investment in your career and professional development. To kick-off the 2019 Florida Interpreter Conference, East and West Coast Interpreter Trainers Karen Borgenheimer (Florida) and Daniel Tamayo (California) have joined forces for this awesome 5-hour interpreter training pre-conference workshop! This event promises to be one of the most interactive, intense, fast-paced trainings—with good doses of humor—that you have ever attended! This 2.5-hour, language-­neutral mini-clinic is designed to help interpreters improve voice quality through hands-on guided practices on: Intonation and Expressiveness, Articulation, Enunciation, Proper Breathing Techniques and Voice Projection. Participants will learn to use their voices EFFECTIVELY for improved voice QUALITY. The interpreter’s tool of the trade or “musical instrument” is his/her voice, and as such, the interpreter must learn how to achieve a voice that is: DISTINCT, INTELLIGIBLE, CLEAR, EASILY UNDERSTOOD and HEARD. Descriptive essays with proper expression, breathing and voice control. In this practical and highly interactive 2.5-hour workshop, the presenter will share translation concepts and strategies that will help interpreters improve the quality and ease of their renditions. The aim is to help participants overcome several of the most common challenges faced when interpreting in sight, consecutive and simultaneous translation modes in the legal setting. Effective, on-the-spot transfer of meaning between English and Spanish when dealing with words and concepts that pose challenges during transference into the target language. **All materials used in these workshops have been specifically designed to target problematic situations frequently encountered in the interpretive process. The agenda can be found here or on the Cvent phone app (found below). All workshop information will be available from the CrowdCompass App. 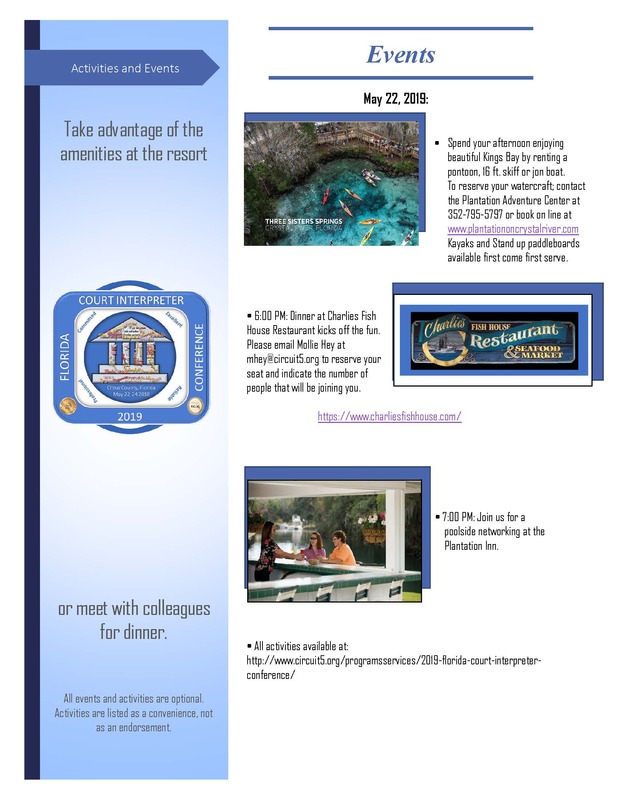 Please contact Todd Tuzzolino at 352-401-6702 for more information on continuing education.